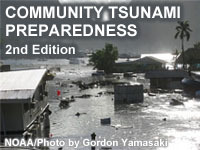 This lesson is designed to help emergency managers prepare their communities for tsunamis. Topics include basic tsunami science, hazards produced by tsunamis, the tsunami warning system, the importance of public education activities, and how to craft good emergency messages and develop tsunami response plans. The lesson also contains links to extensive Reference and Resources sections. I think that people have to be educated in their community about tsunamis in order to prevent hazards. I learned new things about Tsunamis, and relearned things I had forgotten about Tsunamis. I have worked as a planner on the Pacific Coast. This lesson is one of the best I ever seen. I love it!!!!!! This was a very informative training course. I think this module contained very important information about the threat of tsunamis. This module contained useful information on how to stay safe from a tsunami, as well as what to do when a tsunami event has occurred. this is very good training topic i ever seen about the tsunami! A course worth taking if you want to know more about Tsunami's, their orgin, historical impacts and building community preparedness. I appreciate the resources this course provides that can be used for instructing the public on Tsunami preparedness. I highly recommend this course. December 2017: The Resources and References pages were updated to reflect current links, including a direct link to all US Tsunami Warning System information. The lesson updates also include information about NTWC and PTWC areas of responsibility as of 2017. October 2015: Recent additions include updated hazards information and other revisions to reflect the evolution of the warning process since the original 2011 publication. Additional details about meteotsunamis and recent meteotsunami impacts on the U.S. East Coast are provided. The lesson also offers updated examples of National Tsunami Warning Center (NTWC) and Pacific Tsunami Warning Center (PTWC) products, as well as information about the updated TsunamiReady Guidelines, to be implemented beginning in 2016.